The Pakistan sand cat is a subspecies of the sand cat found in the deserts of Pakistan. It is the size of a domestic cat and the smallest of wild cats. Adults reach up to 22.4 inches in length and weigh up to 7.5 lbs. Males are larger than females. The most distinctive characteristic of this cat is its noticeably broad head, with large and pointed ears. Its fur color is sandy yellow with very pale stripes. The tip of the tail is black with black rings, and the paws are covered with long hairs which help to protect the skin against the hot sand. The sand cat is considered sacred by some, and archeologists believe that the sand cat may have been domesticated and kept as a pet in ancient Egypt. Sand cats are only known to occur in sandy and stony deserts, and they are able to survive in extreme conditions with sand temperatures reaching over 225 degrees (F). In the daytime, they are able to keep cool by hiding under rocks or digging burrows, emerging only at night to hunt. Diet consists of rodents and other small mammals, lizards, and insects. Pakistan sand cats are able to survive for long periods of time without drinking water and most of the water in their diet is derived exclusively from food. Little is known about the behavior of this species. Its mating call is said to be very loud and similar to the sound of a small barking dog. Females may give birth to two to four kittens after a gestation period of 59 to 63 days. The sand cat is the only wild cat that is not threatened with loss of habitat since it is found in the desert. 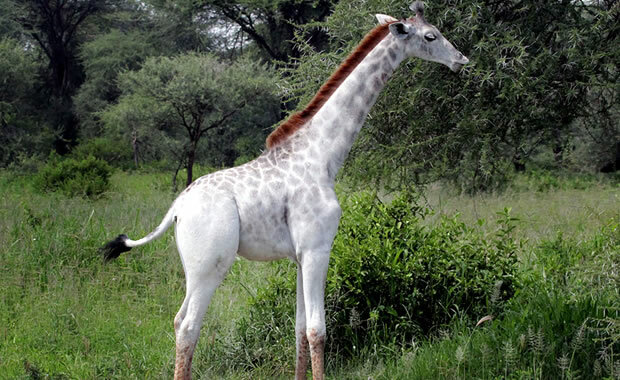 But this species is threatened by hunting and collection for the pet trade. Some are killed by humans who consider them a threat to their livestock. Because sand cats live is such vast, desert locations, they are hard to study and keep track, and population estimates are not available. Copyright Notice: This article is licensed under the GNU Free Documentation License. 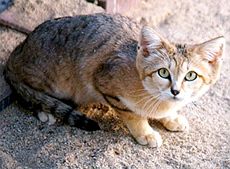 It uses material from the Wikipedia article "Sand cat". Glenn, C. R. 2006. "Earth's Endangered Creatures - Sand Cat Facts" (Online). Accessed 4/22/2019 at http://earthsendangered.com/profile.asp?sp=64&ID=6. Need more Sand Cat facts?